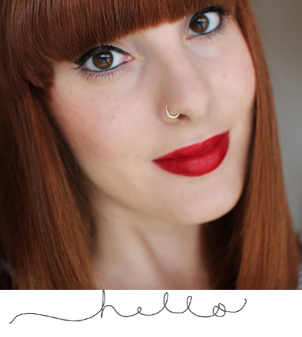 You know when a blog post idea completely slips through your mind, you do said ‘idea’ and then you randomly think about that experience four months later… well yep, that is exactly what happened here. Last Christmas Joe (my hub) bought me a gin tasting experience. He knows how much I adore gin (big fan of Hendricks, Opihr and Bombay Sapphire), so my eyes lit up when I saw a printed letter of Mr Fogg’s Gin Parlour Tasting experience in my stocking. It wasn’t until June when we booked our spot. If you’re not familiar with Mr Fogg’s Gin Parlour, it’s located near Leicester Square, and is next door to Mr Fogg’s Tavern. The parlour has a great variety of gins to try, along with a wide variety of cocktails and botanicals. As well as lots of English varieties, there are lots from around the world. There’s a fun fictional story behind the bar – the idea is that Phileas J Fogg, from the story ‘Around The World in 80 Days’, inherited the townhouse in St Martin’s Lane when his Aunt Gertrude passed away. The Tavern downstairs is run by Aunt Gertrude’s loyal housekeeper Fanny McGee, as an raucous hangout for her theatrical friends. But the drinking den for the evening was actually upstairs and more sedate Gin Parlour & Salon kept by Mr Fogg himself. When we arrived, we waited by the ‘secret door’ and a man appeared – he was very eccentric and a great laugh. We were lead up the stairs and greeted by some ladies dressed in old fashioned 1890’s Western Saloo dresses, who lead us to our seating area. We entered a quaint vintage looking room that was styled like a homely living room space, but with a bar – lots of patterns, textures, gilt picture frames, old school lampshades and antique furniture. Oh yes! Once seated we received two gin’s and some little nibbles. Our waitress gave us a little history lesson on gin. 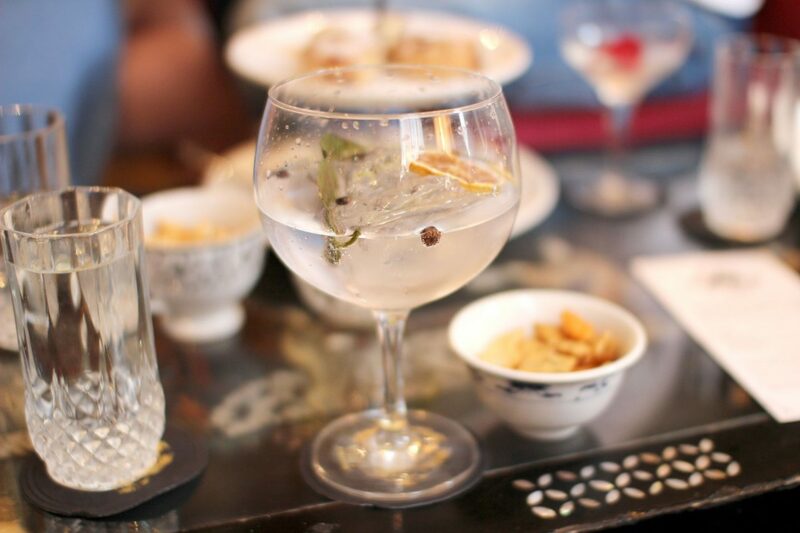 Did you know gin was invented by the Dutch? I thought it was us brits who invented it, so you learn some new every day! Then, explained our gin in detail – an “old Tom” type served with peppercorns, a slice of orange and some seaweed looking thing (sorry, I can’t remember what it actually was). This particular gin was apparently popular in the 18th Century in England. T’was tasty, a little sweet, but also had a bit of a kick. 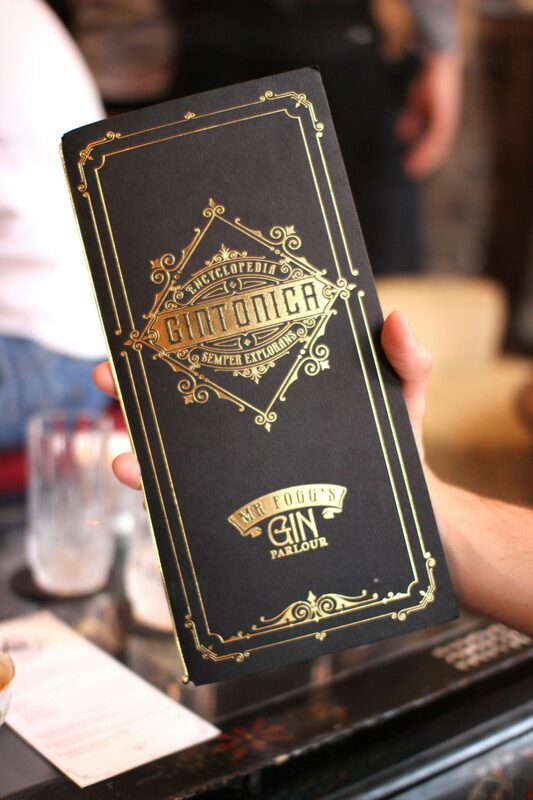 Whilst we were sipping our G&T’s, she handed us the gin encyclopaedia for us to choose our tailor-made G&T’s. There were pages and pages to choose from, so it took me a little while to decide. The waitress was really helpful and knowledgeable and was able to give us great advice on what to try. I went for a pink pepper gin, served with a slice of orange, peppercorns and juniper berries . Very nice – a little spicy. 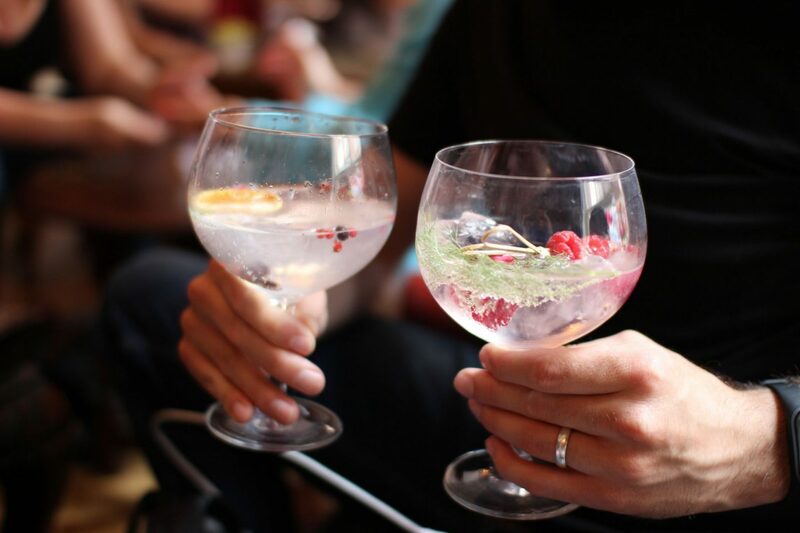 Joe went for a raspberry gin served with rosemary and raspberries – very fruity and refreshing. Out of the two, I preferred Joe’s choice, as mine was quite similar to the first gin we had experienced. The only downside to our experience was it was very busy and a little crammed. However, it had a nice atmosphere. Everyone seemed very jolly and enjoying themselves. Would I recommend? Absolutely, it’s a must visit if you love gin! My tip would be to book in advance to ensure you have the date you want. And why not make a London day out of it? 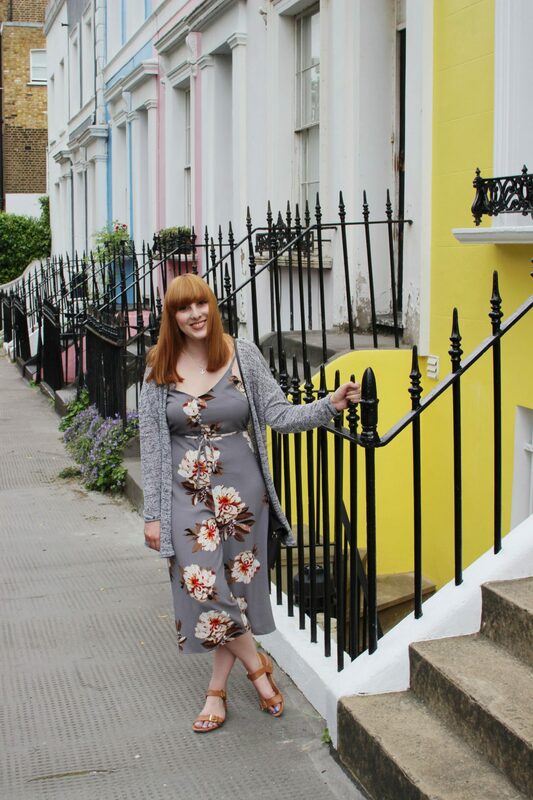 Before heading to Mr Fogg’s, Joe and I brunched at Farm Girl, wandered around the streets of Notting Hill and then wandered the streets near Covent Garden. There’s endless things to do in London, so make it a date day with your other half or friend(s).